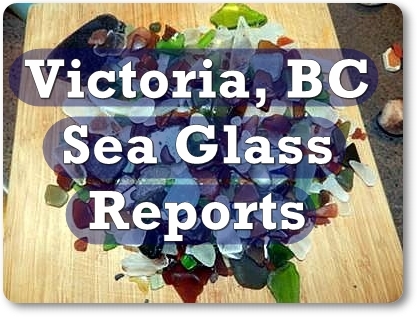 Victoria, BC - Sea glass reports on Vancouver Island in British Columbia, Canada. Lin and I have lived off and on across the strait from Victoria, BC, In the Port Angeles area of the Olympic Peninsula. We only were able to go to Victoria once and didn't have a chance to explore the beaches - but we found the city very attractive and still have plans to return sometime in the future - especially with sea glass in mind. Here's a video of looking for sea glass in Victoria itself and below are links to reports from in and around the Victoria, Vancouver Island Area. The video doesn't identify the exact beach so a little exploring is needed. From Port Angeles, Washington, USA, Victoria is a 40 km (25 mi) ferry ride across the Strait of San Juan de Fuca. Good sea glass is found in the area of Victoria, as the strait is big enough to allow ocean swells in from the Pacific and open beaches on the south and west sides of Vancouver Island have some great sea glass. Carnival Glass Near Victoria, B.C. Art deco pattern - Victoria, B.C. Why can reports on Vancouver Island Sea Glass vary considerably between two different people? Sea Glass Reports can vary from one tide to the next and also from low tide to high tide. For the above reasons, we try to verify these Sea Glass Reports with actual photos whenever possible. So take your camera to the beach! and be sure to report your Sea Glass British Columbia's Vancouver Island!